Given an array of non-negative integers, you are initially positioned at the first index of the array. Each element in the array represents your maximum jump length at that position. Determine if you are able to reach the last index. For example: A = [2,3,1,1,4], return true. A = [3,2,1,0,4], return false. We can track the maximum index that can be reached. The key to solve this problem is to find: 1) when the current position can not reach next position (return false) , and 2) when the maximum index can reach the end (return true). The largest index that can be reached is: i + A[i]. 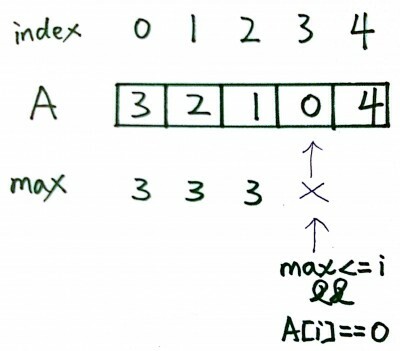 int max = A; //max stands for the largest index that can be reached. if A[i]=3 we can jump on i+1, i+2 or i+3. As we are iterating through i, max<=i means that we've reached the last accessible node – cannot jump further, ant current value is 0, meaning that if we do jump on that step, we'll stay there. why we use "max<=i" ? Clear code solution and explanation! If you start from index 0, you can reach 2 and then, you cannot move forward. The above code will return true assuming that you start from 1. We can just work our way from index 0 and see if we reach the end.